Speaking during Monday's Worldwide Developers Conference keynote, Apple senior vice president of worldwide product marketing Phil Schiller touted the Mac App Store as the premier online store for computer applications. Apple's desktop app store reached that position just six months after its January 2011 launch. In fact, Schiller says, the Mac App Store is beating similar offerings from Best Buy, Walmart, and Office Depot-although the Apple executive did not say whether that's being measured in sales volume, revenue, customer base, or any combination of the above. The Mac App Store was first announced last October and opened its doors in January with more than 1,000 applications. Apple hasn't provided numbers on just how many apps the store now features, but today the Entertainment category alone has 993 applications-and notably, Entertainment is separate from the much larger Games category. The Mac OS X 10.6.6 update put an App Store icon into the Dock by default, giving it prominent placement. This appears to be paying off for developers in the Mac App Store. Schiller stated that Feral Interactive has doubled its revenue, and sales of image editing app Pixelmatorquadrupled to $1 million over the first 20 days in the store. Pixelmator is a $30 app, so that's at least 33,000 new customers. The Mac App Store is in good company, alongside the also-number-one iTunes Store, which has sold more than 15 billion songs, and the year-old iBookstore, which has cranked out 130 million books. Then there's the iOS App Store, now hosting 425,000 apps. Of greater interest to the developers attending WWDC, Apple says it's paid out $2.5 billion to developers for iOS apps. That works out to roughly $3.6 billion in revenue, with the extra billion going to Apple on a 70/30 split. 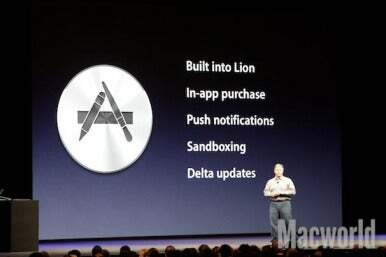 The Mac App Store will be improved in Lion, which Apple also previewed on Monday. New features include in-application purchases, push notifications, and faster software updates due to an incremental update system.